How do surface tension and capillary forces work in the feed? In diagram 1 from the chapter Bubbles and Bottles, the problem was to get air inside the bottle/reservoir. Water outlet and air inlet are determined by the same component, the bottleneck. I always found it to be good ingeneering practice to have a component or an element of it carry out one function, only. This permits to adjust it without affecting any other function, or at least minimise the interference. I show this in diagram 1. The first function is “feeding the ink”. For this, I chose a narrow capillary, d1 (two, actually, about that, later). The second function allows controlled entering of air (air inlet). The surface tension will prevent the ink from flowing out because the hole in the tank has a diameter d2 which is active within the capillarity range. Like in diagram 1, where the ink is drawn out of the reservoir by the suction of the paper, the vacuum Pin increases. At the point, where the combined forces of vacuum and the atmospheric pressure Patm are stronger than the surface tension of the membrane, the membrane ruptures for a moment and lets in a bubble of air. You know why. This design provides a subtle regulation within a small variation; thus, the subtle change in pressures Pin and Patm has no noticeable effect on the ink supply. A hint for the capillary designer: An easy way of testing whether a diameter is within the range of capillary action is: check the meniscus. If it curves concavely, towards the fluid, yes, then it is within the range of capillarity, and it can perform well. If it forms a semi-drop, when it curves convexly, away from the fluid the design needs to be corrected. I used a measuring microscope to observe the curvature of the meniscus at the lower end of a capillary to examine the effect of alterations. You will appreciate that the standardisation of the ink was crucial. 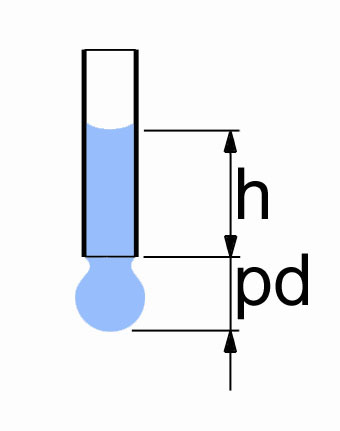 For calibration of the ink, I modified the pendant-drop-test, diagram 2, to suit my purpose, where I measured the drop size (length pendant drop) at a constant capillary height h.
Diagram 3 shows the progress towards the application of the above to the design of a fountain pen feed. The feed is in blue/grey and the nib in gold. I have chosen a schematic display to explain the function without the distraction of individual design features, to which I will come later. I will address the various functions of the feed and how they are carried out. Since we have focused on the air inlet, let’s stay with that. You can see the crossover where the diameter d1 of the air-hole increases from the capillary diameter for holding the membrane to a larger, still capillary range diameter d2. This way, I can accurately determine at which position I want the ink to form this meniscus. This is the core principle of controlling the direction and amount of ink and air flow in the feed: Significant, abrupt crossovers in cross section. 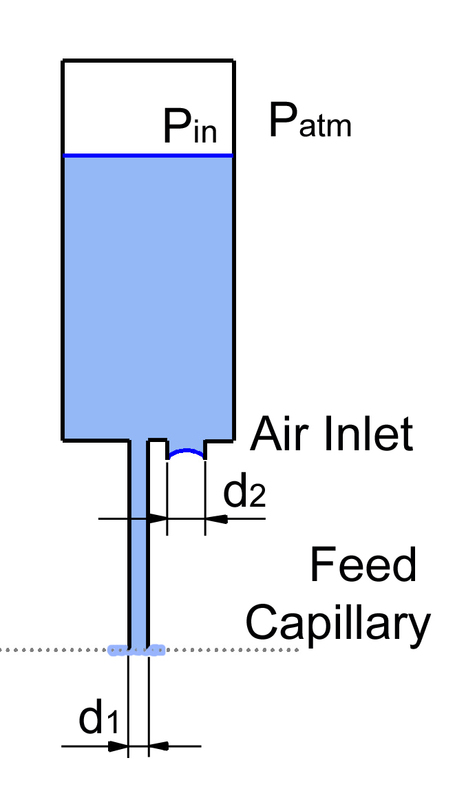 The primary purpose of the air canal d2 is to permit air access into the reservoir through the feed. The increase of diameter from d1to d2 prevents the air canal to be filled with ink. The conical, yellow section in the diagram is the nib with its narrowing slit. The capillary forces are so strong that no ink comes off slit of the nib… Unless, it meets paper, which has a higher hygroscopic/capillary force than the capillary force in the nib tip. Photo 1 shows a magnified piece of paper. The fibres’ suction due to capillary action as well as their hydrophilic characteristics is much higher than that of the nib. Another significant component of the feed is the array of slits or fins arranged perpendicular to the axis of the feed, often called collectors. This is shown in diagram 4. They are capillary slits arranged to absorb any excess supply of ink. (The causes for excessive supply I explain in the chapter on Temperature and Air Pressure) The slits are directly connected with the feed capillary and vent into the air canal. Their capillary pull is less than the feed capillary, nib and paper, but more than the air canal. Since they are marginally wider than the feed capillary, the ink does not enter into the slits unless an increase of the hydrostatic pressure occurs, caused by the height (weight) of the column of ink, which is usually compensated by the slight vacuum in the air-pocket, see diagram 1. The height of the filling of the slits is given by the capillary parameters of the feed and the surface characteristics of the ink. The maximum height I have observed in my experiments with many fountain pens amounted to a 30mm. I explained this in chapter Capillaries. 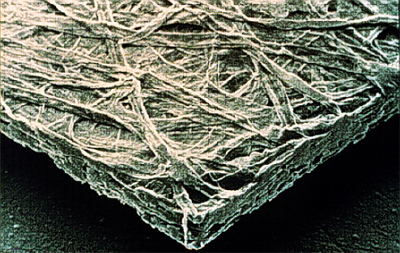 Marginally, this dimension can be influenced by the width of the ink feed capillary of the feed, however, if it is too narrow, the ink supply is reduced and may be insufficient. This is the reason why I put two ink capillaries in my feed design, namely, to create enough capillary pull and at the same time provide sufficient ink. Now, that’s when the balancing act starts. When a surplus of ink supply occurs, the capillary action of the overflow slits must take the ink away from the feed capillary before a noticeable variation of ink supply at the nib occurs. Desirably, the capillarity of the nib and feed capillary is high enough so that the slits can fill. Since the slit closest to the nib experiences the highest hydrostatic pressure fills first, then those above it. They don’t fill simultaneously but from the bottom upward. Hoping for the supernatural, I added an extra slit to my feed design, just in case. Since at the situation of oversupply of ink the function of the air-hole and air-canal are not needed, I designed the feed so that, after all the slits are filled, the air-hole membrane breaks first. Then the air-canal can absorb surplus ink, and as long as the fountain pen is not shaken, the ink will stay in there. The last membrane/meniscus to break is the one at the nib. May this be as it is, whatever comes first, it is undesirable. The magic trick is that all will be emptied through writing or absorption with blotting paper when touching the nib. I have seen feeds with excessive numbers of slits (above the 25 mm limit). They are useless. Some reduce the width as they go up. Doesn’t work, unless they are in the vicinity of the feed capillary, and once they are full, they never empty. Eventually, they clog up and become useless. During general use, the overflow slits are empty so that their full capacity is available in case of need (oversupply of ink from the reservoir, etc.). If they have been filled, they must be emptied first when writing starts, before ink is drawn from the tank. I would have liked to design a feed with slits increasing in diameter towards the nib, like a small Christmas tree. This would have required a different, unusual shape of the grip section to house it. The fountain pen market is very traditional. Management was not prepared to take the risk. As far as I can see, we have covered now all the functional aspects of the feed. Remind me in case I have forgotten something, which can happen quite easily when one is very engaged in writing. Let us have a look at the design process and design criteria, now. The next chapter focuses on the Development of the Feed.